Guru Ghasidas University Admission 2019 - Guru Ghasidas Vishwavidyalaya (A central university), Bilaspur invites applications for UG and PG admission for the academic session 2019-20 through Vishwavidyalaya Entrance Test (VET). HNB Garhwal University Admission 2019 - The Hemavati Nandan Bahuguna Garhwal University (HNBGU), invites online applications for admissions in following Academic Programs in its three campuses at Srinagar, Pauri and Tehri for the session 2019-20 through University Entrance Test and Counseling. Gitam University (Centre for Distance Learning) has published notification for admission to the Diploma, Undergraduate and Postgraduate Degrees for the academic session 2019. ANUPGCET 2019 Notification -Acharya Nagarjuna University, Guntur invites applications for the admissions into Postgraduate Courses offered on its Campus, PG Centre, Ongole and its Affiliated Colleges for the academic year 2019 through ANUPGCET - 2019. Andhra University AUCET 2019 - Andhra University, Visakhapatnam invites applications for admissions into M.Sc., M.A., M.Com., M.H.R.M.,M.J.M.C., M.L.I.Sc., M.P.Ed., M.Ed., M.Tech, M.Sc. 5-Year Integrated Courses in Geology and Chemistry (Applied Chemistry) through AUCET-2019. 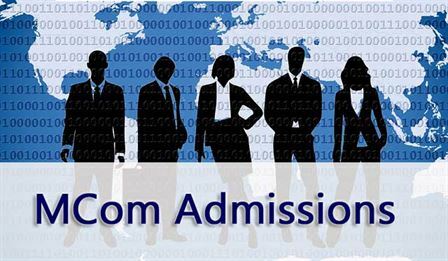 IGNOU MCom Admission 2019. Visit us for more details on dates, eligibility and application for IGNOU M.Com Admission 2019. Indira Gandhi National Open University (IGNOU - Distance Education) invites applications for admission to Master's Degree Programmes for the Academic Cycle commencing from January 2019. SOL Delhi University MA M.Com Admission 2018 – University of Delhi (DU) School of Open Learning (SOL) opens admissions for the year 2018-19 to Postgraduate (PG)/Master’s Courses. Admissions to SOL DU 2018 will be notified on the official site. University of Calcutta M Com Admission 2018 - Calcutta University has released notification for admission to the various M.Com (Day & Evening) Courses for the session 2018-19. Alliance University, Bengaluru invites applications for admission to Master of Commerce (M.Com) Course at the Department of Commerce, Alliance School of Business for the commencing year August 2018 . Dravidian University DUCET 2018 Notification - Dravidian University, Kuppam, has announced Dravidian University Common Entrance Test (DUCET-2018) for admission into the MA, M.Sc., M.Com., M. L.I.Sc., M.Ed and MSW Programmes for the academic year 2018. SASTRA University BTech MTech MPharm MCA MBA BCom Law Programs 2018- Sastra University has released the notification from eligible candidates to admission in various programs for the academic year 2018-19 . Periyar University has published official notification for eligible candidates for admission into the following Post Graduate Programs at PG Extension Centre, Dharmapuri of the academic year 2018-19. Directorate of Distance Education (DDE) of Kurukshetra University has released notification for admission to the various UG, PG and Certificate Courses for the academic year 2018-19 . Mangalore University Distance Education Admission 2018 - Applications are invited by Mangalore University, Mangalagangotri for admission to Distance Bachelor of Arts (B.A), Bachelor of Commerce (B.Com), Bachelor of Business Administration (BBA), Master of Arts (M.A) and Master of Commerce (M.Com) Programs offered in various subjects for the academic session 2018-19. Calcutta University has released notification for admission to the various M.Com (Day & Evening) courses for the session 2018. Alagappa University invites applications for admission to the following programmes offered through Distance Mode for the Academic Year 2018 .